It’s Wednesday Dec. 13th and the Green Box is out again! This week we are featuring designer John Hardy. John Hardy jewelry is handmade in bali and based on the artistry of the Balinese. The company focused on sustainability, being environmentally friendly and furthering their unique style into highest realms of luxury. 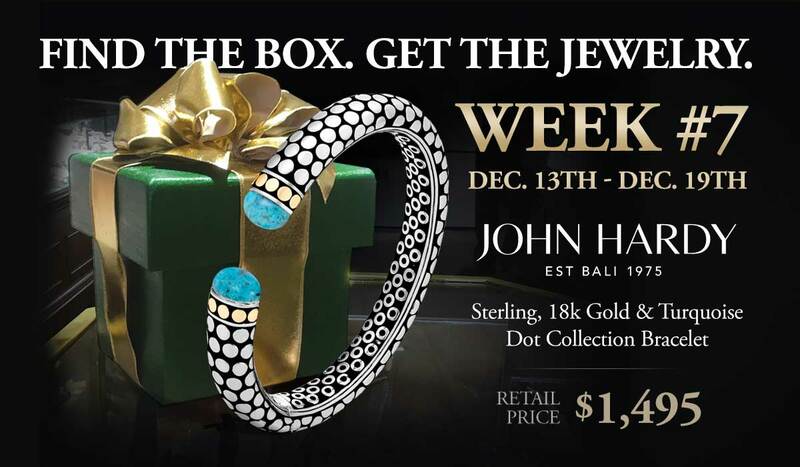 The piece of the week the box finder will receive is a sterling silver, 18k gold & turquoise, Dot Collection Bracelet. The piece retails for $1495. Please keep in mind, that our box is not hidden in a place that is dangerous. If you would like a clue in a day in advance, come in and try on a piece of John Hardy. Wednesday Dec. 13th Clue: What should have been wet, but was drier than dust. Thursday Dec. 14th Clue: Stop on by for a sip in the shade.